We love the huge choice and hardware finish options on Odery snares. The only small drawback is the over-fussy and noisy strainer. Vast range of options. Impressive build. Odery is the Brazilian company most of whose Custom line shells are made from two basic shell options, 100 percent araucaria (a Southern Brazilian evergreen conifer) or a 50-50 hybrid of Indian teak and araucaria - as found on the snare we're reviewing today (pictured bottom). The snare has a hybrid 50-50 teak-araucaria, 15-ply shell, with a rich brown figured outer teak veneer. It is fitted with the special wood hoops as previously seen on the Custom kit. These hoops are made by Odery (as are all shells) and consist of eight curved block sections of Brazilian Tigerwood, staggered four-deep (ie: 32 blocks altogether). The tension bolts are sunk into the hoops and have 3mm thick protective and cushioning nylon washers. 'Odery Handmade Custom Drums' is heat-branded into the hoops and the same legend appears on the badge, which is a large black and silver shield, mounted on a 1/3" thick black rubber gasket. "The metal fittings are finished in brushed steel, one of many hardware options"
The metal fittings are finished in brushed steel, one of many hardware options including copper, brushed old copper, 24 carat gold, gloss or matt black nickel, brushed old bronze, brass or steel, aluminium, black chrome, old silver or satin brass. As with the shell, the hardware is fabricated by Odery itself and the snare has 10 of Odery's Vintage lugs, which are substantial double-ended tube affairs in solid brass, with just a single-contact fixing in the centre. The effect of the thick, multi-plies is to raise the natural pitch of the shell and transfer that to the head. So you immediately have a bright tone that is simultaneously controlled. In fact, until slackened off a bit, this drum was boxy. 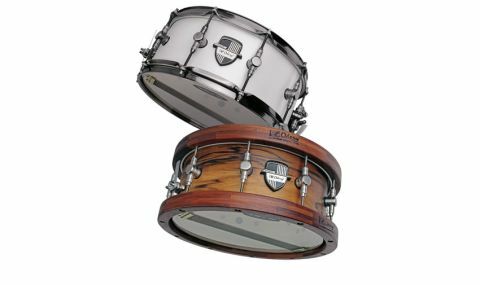 "Rim-shots and cross-sticks are wood-on-wood, so there is a clave-like brittleness"
Compared to the previously-reviewed 100 percent Araucaria Odery Custom snare, the teak seems to darken the sound and with the wood hoops. It started off tubbier and once slackened back a little was definitely fatter. It's a warmer, slappier, slightly softer drum. The wood hoops undoubtedly moderate the attack and intensify the woody timbre. Rim-shots and cross-sticks are wood-on-wood, so there is that clave-like brittleness with the shrill ping, piercing yet rounded and ethnic. Also, the block hoops feel solid under rim shots - we've heard of plywood hoops eventually cracking up. The other effect of the thick shells and outside-cut bearing edges is to ensure that this drum is sensitive right up to the hoops. Incidentally, a word of warning, if you are contemplating a snare with these wood hoops, you need to find a snare stand with a basket that will open up wide enough to accommodate the extra width.